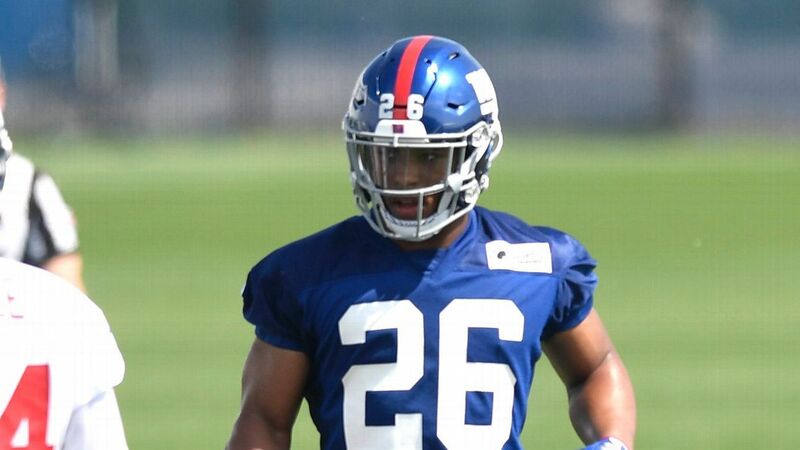 NEW YORK — New York Giants running back Saquon Barkley bought his parents a new house and didn’t need his first contract to make it happen. That is where some of that fresh endorsement money from Nike, Pepsi and Panini America is headed. Barkley doesn’t plan to use his football earnings on any lavish purchases, such as the home he recently bought for his family in Whitehall, Pennsylvania. Barkley hasn’t even signed his rookie contract with the Giants, who made him the No. 2 overall pick in this year’s draft. New York’s newest star Saquon Barkley spills on his philosophy on weightlifting, how he dropped his 40 time and the one piece of advice he’d give to other aspiring football stars. “Once I realized when I declared for the NFL draft and kind of realized where I was going to be drafted, that was something I was like, ‘You know what? Kind of want to follow the Marshawn Lynch method. I don’t want to touch that. I want to invest it, put it in the right peoples’ hands and learn as I continue to make investments. And just live off the endorsement deals,'” Barkley said on the red carpet for the CC Sabathia Celebrity Softball Game on Thursday night. He plans to follow in the financial footsteps of players such as Lynch and New England Patriots tight end Rob Gronkowski. They have both made an effort not to spend their NFL paychecks, and instead capitalize on their marketability. Barkley’s first major purchase with the money he already has made, thanks to the help of his Roc Nation team landing several major endorsement deals, was a house for his family. It’s a four-bedroom, three-bathroom, 3,400-square-foot home not far from where he spent most of his childhood. Purchasing the home for his family was the fulfillment of a promise he made long ago. “I’ve been promising my mom, I think since I could talk, honestly 2 or 3 years old I know it sounds crazy, but I swear I’m not lying to you guys that I’m going to buy [my mom] a house one day,” Barkley said. “My family has been through so much and made so many sacrifices for my brothers and sisters. The Bronx-born Barkley moved to the Lehigh Valley in Pennsylvania, where his grandparents lived, when he was 5 years old. His family eventually settled in Coplay, where he became a football star at Whitehall High School. The former Penn State star wanted his younger brother and sister to finish school in the area. That is part of why Barkley’s mother, Tonya Johnson, chose not to move far. It’s about an hour and a half drive to where Barkley stays in northern New Jersey as a member of the Giants. That’s saying a lot. Barkley was named a consensus All-American his junior season at Penn State. He was considered a near-flawless prospect whom Giants general manager Dave Gettleman has described as a “special young man.” Barkley has even received rave reviews from teammates early in his Giants career. He seems to be doing just fine off the field as well as a new father and thoughtful son. Getting the house for his parents out of the way without touching a paycheck from the Giants was a meaningful gesture.